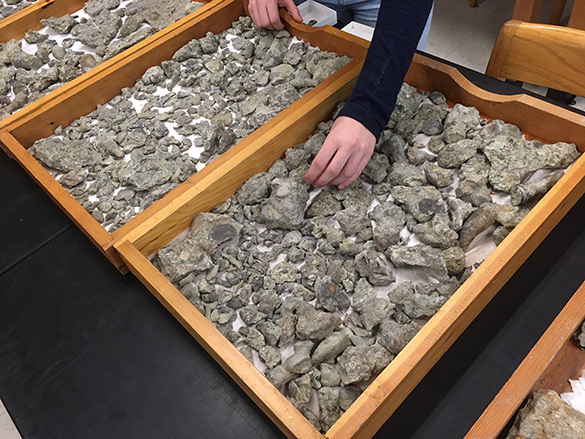 Wooster, Ohio — The Invertebrate Paleontology class at Wooster set to work this afternoon on the excellent fossils they collected at the beginning of last week. 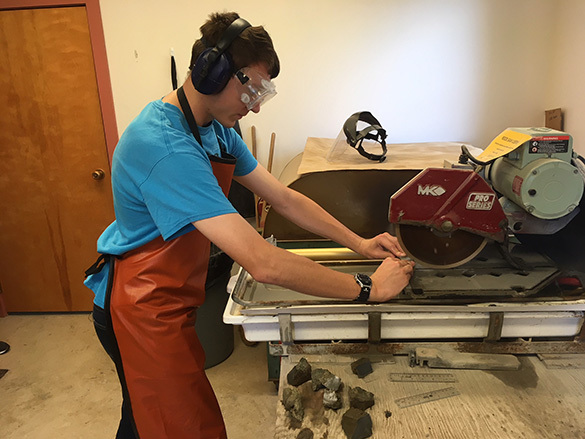 They had already washed them carefully, using soft brushes and soap, and now were learning how to trim them down with our faithful basement rock saw. Grant Holter is seen above doing his very first cut. 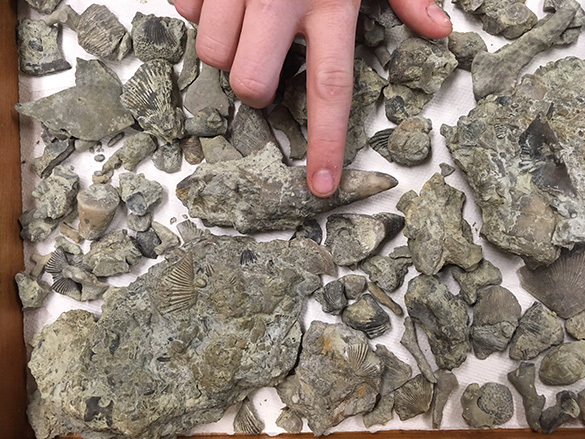 All the specimens are from a single outcrop of the Upper Whitewater Formation (Upper Ordovician, Katian) just south of Richmond, Indiana. The spinning steel blade has industrial diamonds embedded in its periphery, which grind quickly through our soft limestones. 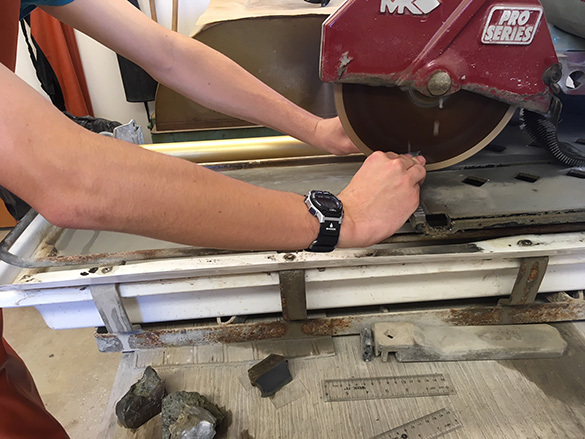 The blade and rock are continually sprayed with water to keep the blade from overheating, lubricate the cut, and to capture the dust. The newbies to our saw learned fast. Each student has two trays of specimens, which are right now in their raw, unprepared and unlabelled state. Julia Pearson examines her very full trays. Juwan Shabazz is behind her. A closer look at Julia’s treasures. An even closer view. 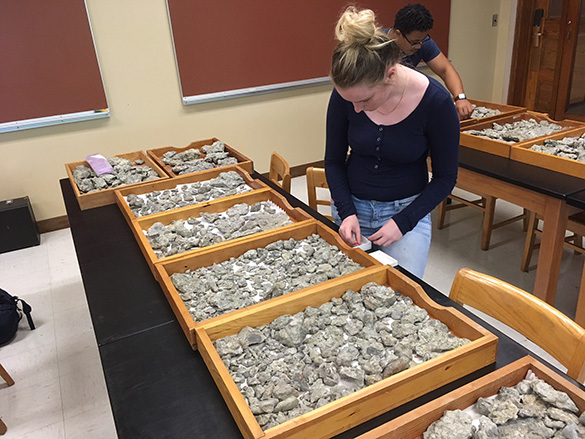 We can easily now identify abundant brachiopods, bryozoans, and rugose corals — the big three groups. 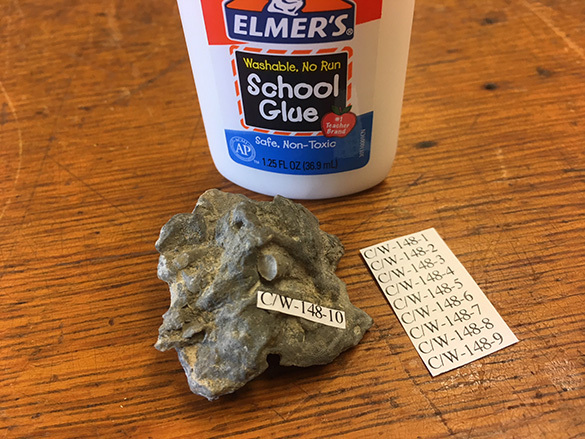 Finally for today the paleo students learned how to label their specimens using water-soluble white glue and printed paper tags, a technique I learned at the University of California Museum of Paleontology. Next week the class will use the saws, grinders, polishing plates and hydrochloric acid to make acetate peels. This is my favorite paleo process!